A few months ago a select group of attendees enjoyed one of the most enthralling author events Island Books has ever hosted. We had so much fun that I issued Brian Doyle a standing invitation to visit any time. It’s too soon to expect another in-person appearance, but luckily for all of us, he was able to pay a visit to our virtual space on the web, this here blog, to talk about his new novel. Chicago tells of a year in the life of one sports-obsessed young man living in a big city on the shores of a “vast and muscular lake.” It’s a story of first jobs, first girlfriends, and first encounters with “gangsters, gamblers, policemen, a brave and garrulous bus driver, a cricket player, a librettist, … a shy apartment manager, and many other riveting souls, not to mention a wise and personable dog of indeterminate breed.” Since it’s a Brian Doyle production, it’s funny, heartfelt, observant, and guaranteed to make you want to read as much of his writing as you can get your hands on. The man behind it was gracious enough to field of few of my questions about the book, his work, and life in general; our conversation is below. Island Books: Chicago is in some ways a prototypical first novel, featuring a protagonist who seems very much like a younger version of the author. Why write such a book in mid-career? Come to that, as someone who’s written plenty of autobiographical work, why fictionalize at all? 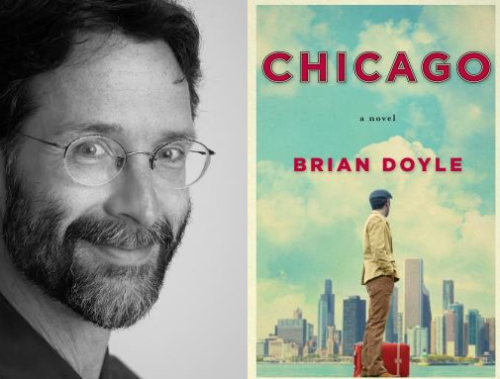 Brian Doyle: As with all of my novels there was no plan in it—I had occasion to start jotting little notes and stories about Chicago, and it swiftly got totally out of hand, and amazingly there was a very cool dog at the center of it all, so I just went with the river. I suppose now (I always wait to think about my novels until after they are done, for fear of mucking with the way the story wants to go) that I always wanted somehow to write about Chicagoness, to sing and celebrate that great wild huge rough most American of cities, and finally the right window opened. While I did live there for two years fresh out of college, and did work for a magazine in the Loop, and did play ball fanatically, everything else is utter fiction. To answer that actual question, I don’t think about my career—I just have fun writing and often good things happen. Here we have a book, I think, that wants to be so very sensual that you can almost smell the city, and be bereft when you finish, that your friends the characters have fallen silent. I want evocative more than anything else in my novels—I want you to feel them, swim in them, be absorbed in them. With Chicago you should feel like you just lived there for a year when you were 22 and young and strong and penniless and tireless and silly and open to every hint and intimation and quiet miracle. IB: You’ve included a nice little tribute to legendary columnist Mike Royko in the middle of the novel. Is that pure pastiche or was it inspired by an actual piece he wrote? BD: Pastiche. He’s the greatest American newspaper columnist ever, I think, with great respect for Murray Kempton, and I loved, and still love, his humor and fury and honesty and piss and pith and love of puncturing lies and arrogance. Man, he was the best. It was huge fun to try to write like him. IB: So, the 1977 White Sox. Portly knuckleballer Wilbur Wood. Lithe and speedy proto-Ichiro Ralph Garr. The sweet bat of Chet Lemon. Oscar Gamble and his spectacular coif. I’m not sure I have a question here, other than this: do you really have an autographed Richie Zisk baseball card? BD: Nope—I do have a Brian Doyle card, although I despise the oily arrogant pompous blowhard oily Yankees. Those Sox though—wow—a terrific outfield—they held the city’s heart that summer even when they finally lost the lead at the end; and losing it to George Brett wasn’t so bad. IB: Each of your novels features a particularly intelligent and admirable character who behaves more humanely than just about everyone around him and who just happens not to be a human being himself. 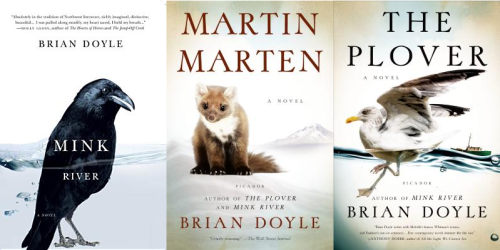 You have talking birds in both Mink River and The Plover, Martin the marten in Martin Marten, and now, most noble of all, Edward the dog in Chicago. I suspect these critters are there because, well, you love animals and find them fascinating, but I also wonder if their presence has something to do with your understanding of storytelling as an elemental exercise. We’re all familiar with the anthropomorphic characters in fables and fairy tales, but going back even further to humanity’s earliest days, narrative has centered on our relationship with the animal kingdom. Our myths are full of spirit guides and totem animals, and it’s likely that the first story ever told around a flickering camp fire involved an animal encounter on a hunt. I’m right that you see yourself as somehow connected to this ancient tradition, right? Or how far off base am I? BD: Not off base at all. I take very seriously the writer as seanachie, storycatcher, storysharer; I think it is a moral responsibility, if you have the urge to write, to be a witness, a reporter, a dreamer, an imaginer for us all. And I constantly think that our literature is so human-centric and human-arrogant. There are billions of other beings on this planet, and they are riveting and fascinating and have millions of other ways to perceive and live. They are not all our sidekicks, and in most cases they are more sensitive than we are in many ways. I want to play with this welter of other consciousness, to open my books to other witnesses and miracles than only those we know and see; isn’t that what fiction does best, poking after what we cannot explain or understand? And yes I have always been fascinated with totem animals—for me it’s probably otters or marten or osprey. Or box-elder bugs, blundering around looking for a warm place to sleep. IB: You mention in the book that there have been four major cities in your life. You live in Portland currently and already have written extensively about the Northwest; now that you’ve covered Chicago, can we expect novels of Boston and New York to follow? BD: I sincerely doubt it, although (a) what do I know and (b) I have a novel coming out next spring (The Adventures of John Carson in Several Quarters of the World) set in 1880 San Francisco. So, again, see (a), what do I know? IB: Fans of your work often observe how warm and affirming it is, yet you’re more than willing to discuss the darker side of life, from poverty and corruption to physical abuse and even mass shootings. You frankly and eloquently express your anger and disappointment about these things, but still leave readers with hope for the future and a smile on their faces. What accounts for your equanimity? Is it to do with your religious faith or a matter of inherent temperament or what? BD: My sister the smiling Buddhist nun says I am congenitally optimistic, as the well-balanced middle child in a large family, but I think it’s more that I just cannot repress the constant stream of amazing examples and chapters of grace and humor and courage and tenderness and humility I see every blessed day. Fact. It’s all there if you look hard enough. I am not always stupid, and I get it that grief and pain and loss and evil are everywhere and daily fare, and people I love are hammered and have died, and I am terrified of fouling the nest so badly that kids can’t live in it, and I am enraged at murderous thugs and bloviating buffoons, but still, man, look at the armies of light pitted against it all! Isn’t that astounding? Listen, I have black dog days like everyone else, but when that happens I seek out little kids and dogs and birds and The Beach Boys, and back up I come, chortling.